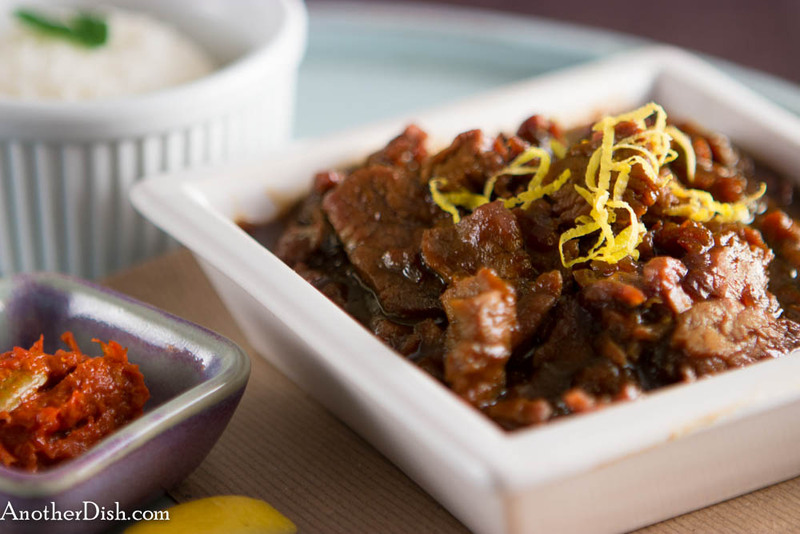 Here’s another one of my favorite Indonesian pork recipes (I have several favorites in this category!). This one is a roasted pork tenderloin that has been marinated in a ginger/garlic/sweet soy sauce. It is served over a bed of crisp, shredded white cabbage, with a drizzle of a unique (delicious!) ginger sauce. I hope you’ll try it! Prepare the marinade by combining the first 6 ingredients (through ground black pepper) in a small bowl. Place the pork in a shallow dish and cover evenly with the marinade. Cover with plastic wrap and refrigerate for an hour (or longer). Meanwhile, prepare the ginger sauce by whisking together the next 7 ingredients (through sambal ulek) in a medium bowl. Heat oil in a small sauce pan over medium-high heat. When hot, add the onions and saute for 3 minutes. Add the sauce mixture. Stirring constantly, slow bring to a boil. Reduce to low and continue to cook until the sauce thickens (about 5 minutes). Remove from heat, cover and set aside. Heat oven to 425 degrees Fahrenheit. Line a baking dish that will accommodate the pork with aluminum foil and place the pork in the dish. Cook the pork until it registers 155 degrees Fahrenheit when inserted with a thermometer in the thickest portion (about 20 minutes) — cooking the pork any longer will dry it out. Remove the pork from the oven and place on a cutting board. Cover loosely with aluminum foil and let rest 10 minutes. Slice the pork into half-inch pieces. Spread the sliced cabbage on a serving platter and place the pork slices on top. Pour sauce over the pork. Serve with steamed jasmine rice. This entry was posted in Indonesian, Main Dishes, Pork and tagged Chilies, Cooking, Food, Food Photography, Foodie, Indonesian, Indonesian Food, Kecap Manis, Recipes, Southeast Asian Food, Spicy on May 29, 2013 by AnotherDish. This recipe is a different take on the standard “spaghetti with meatballs” dish that everyone is familiar with. Bucatini is basically hollow spaghetti, and adds an interesting texture. 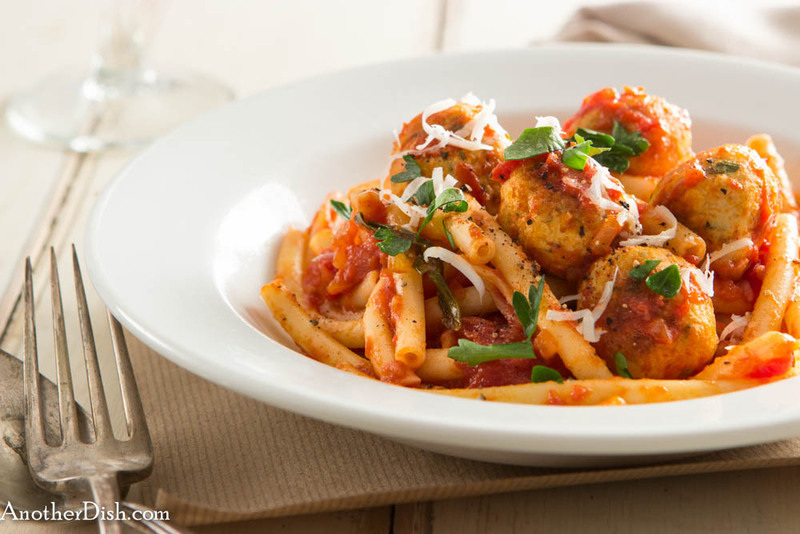 The herbed chicken meatballs are a fresh spin, and are delightful with the homemade tomato sauce. I hope you’ll try this dish! To make the sauce, place the tomatoes and their juice in a large bowl. Vigorously squeeze tomatoes with your hands until no large chunks remain. Heat 2 Tbsp olive oil in a large sauce pan over medium-high heat. Add onions and saute for 3 minutes. Add the tomatoes, bay leaves, salt and pepper. Stir to combine. Cover and bring to a good boil, stirring occasionally. Reduce heat to low and simmer, partially covered, for 1 hour (stirring occasionally). Meanwhile, prepare the meatballs by combining the ground chicken, parmesan cheese, bread crumbs, garlic, egg, parsley, sage and salt in a bowl. Combine well (I use my hands). Form small balls from the mixture, occasionally dipping your hands in a separate bowl of warm water, as the meat mixture can become very sticky to work with. Cover meatballs with plastic wrap and refrigerate for 30 minutes. Heat 2 Tbsp olive oil in a large frying pan. Saute the meatballs until golden brown, about 8 minutes. Add the meatballs and basil to the tomato sauce, and simmer uncovered on low for an additional 15 minutes. Serve over bucatini pasta that has been cooked according to package instructions. Garnish with some chopped parsley and grated parmesan. This entry was posted in Chicken, Italian, Main Dishes, Pastas and Grains and tagged Comfort Food, Cooking, Food, Food Photography, Foodie, Italian Food on May 26, 2013 by AnotherDish. 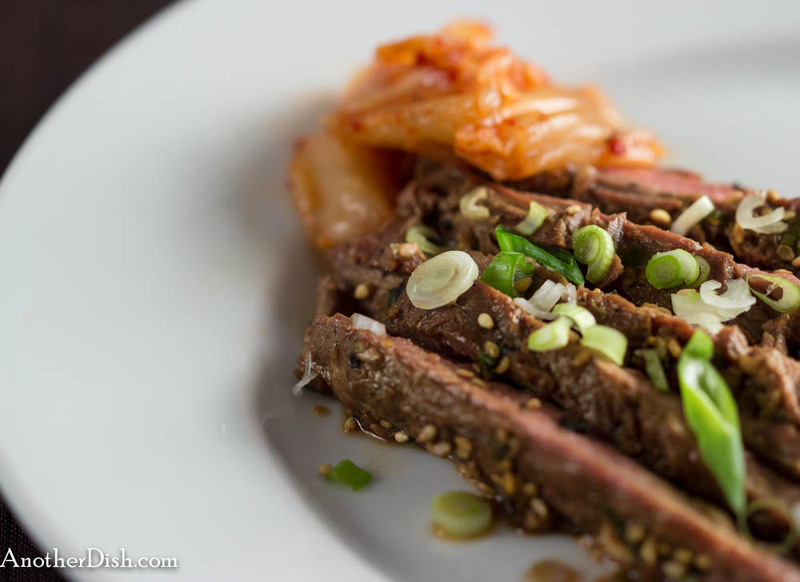 Last evening was another great evening for grilling out here, so out of my stockpile of outdoor recipes I chose to make bulgogi (Korean-style marinated, grilled steak). Easy to prepare, this recipe take a little bit of planning ahead, because the meat marinates (in a wonderful, Korean-style barbecue sauce) for about an hour. I hope you’ll try it! In a bowl, whisk together soy sauce, sugar, sesame oil, scallions, garlic, ginger and sesame seeds. 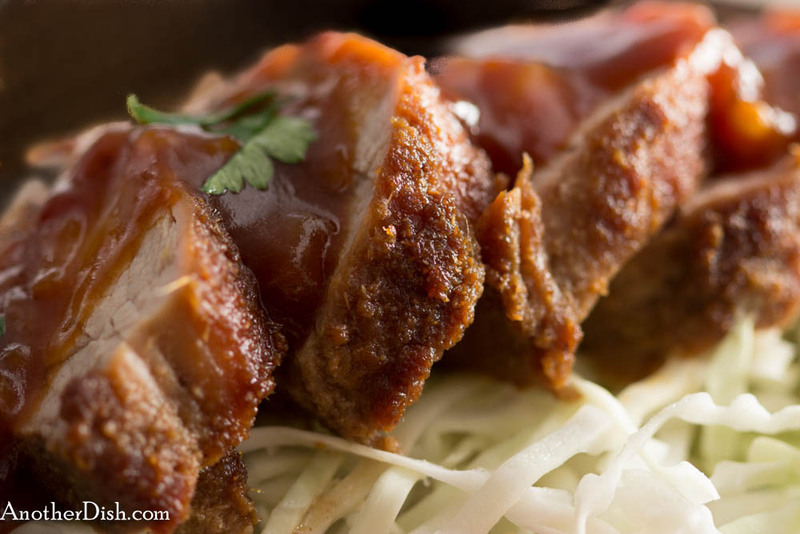 Combine soy sauce mixture with meat in a plastic bag (such as a freezer bag), seal and move bag around so that the meat is well-coated with the marinade. Let marinate in the refrigerator for an hour. Remove from fridge and let stand at room temperature for 10 minutes prior to grilling. When grill is very hot, gill steak for 6 minutes on each side for medium-rare. Transfer steak to a cutting board, cover with foil and let stand for about 5 minutes. Slice beef thinly across the grain (1/8 to 1/4-inch thick). Serve with kimchi, white or brown rice and a green vegetable. Garnish with sliced scallions and a sprinkle of toasted sesame seeds. This entry was posted in Beef, Korean, Main Dishes and tagged Cooking, Food, Food Photography, Foodie, Korean Food, Recipes on May 22, 2013 by AnotherDish. I enjoy stir-fry dishes because they call for the freshest of ingredients, and they are generally quick to prepare (and they can be very healthy, as well!). This is a typical Southeast Asian-style stir-fry that combines fresh, spicy, sweet, sour and salty flavors into an harmoniously delicious dish. I hope you’ll try it! Whisk together sherry, cornstarch and black pepper in medium bowl. Combine well with beef and set aside to marinate for 20 minutes. Meanwhile, prepare the sauce by whisking together oyster sauce, soy sauce, honey and lemon juice in a small bowl. Set aside. Heat the oil in a wok over high heat. Add the garlic and ginger, and stir-fry for 30 seconds. Add the beef mixture, sir-frying until the meat is no longer pink (about 3 minutes). Add the sauce and continue to stir-fry for an additional 2 minutes, until the sauce has thickened. Remove from heat and stir in the chilies and scallions. 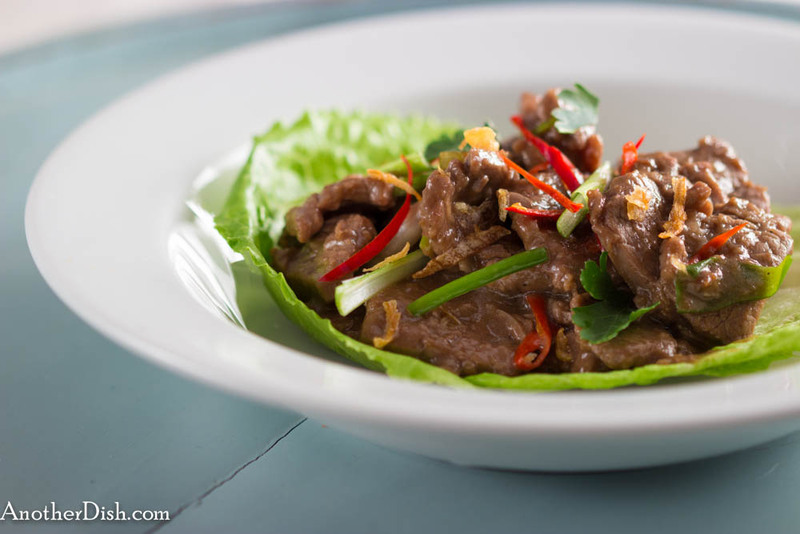 Serve over individual lettuce leaves, together with steamed jasmine rice. This entry was posted in Beef, Main Dishes, Thai and tagged Chilies, Cooking, Food, Food Photography, Foodie, Recipes, Southeast Asian Food, Spicy, Thai, Thai Food on May 19, 2013 by AnotherDish. This is one of my outdoor chicken recipes that I always have the ingredients for, from spring to fall. It’s simple, fresh, and it’s not time-consuming to prepare. Made this last evening when I returned home from work (it was a beautiful, warm evening here, so I had to fire up the grill!). Place the lemon juice, garlic, olive oil, salt, pepper and oregano in a small bowl. Whisk until the ingredients are well-incorporated. Place chicken and the lemon juice mixture in a plastic zip-lock bag. Seal bag and move around so that the ingredients are combined. Refrigerate for about 1/2 hour. Grill the marinated chicken on one side for about 9 minutes, then about 4 minutes on the other. Remove chicken from grill. Slice each breast in half crosswise, so that you end up with 4 even pieces. 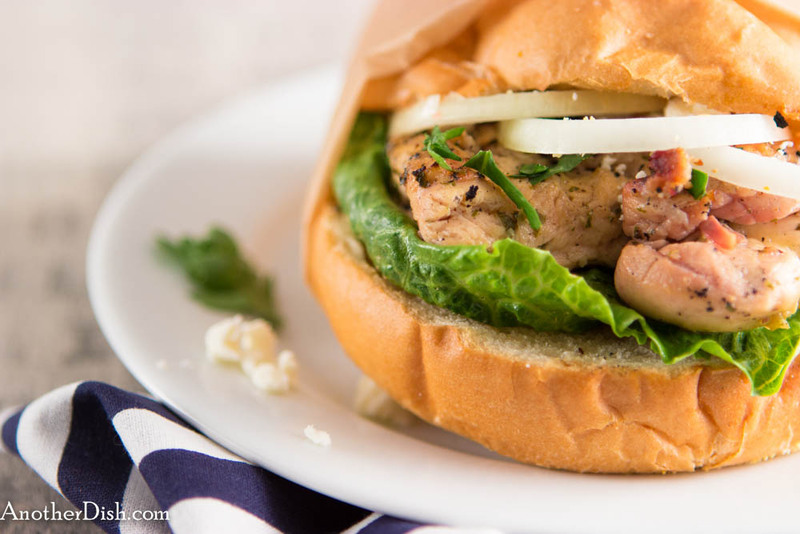 Assemble the sandwiches with the buns (I like to butter them and toast a bit on the grill), lettuce, chicken, parsley, onions and a teaspoon each of the feta. Serve. This entry was posted in Chicken, Comfort Food, Feta, Greek, Main Dishes and tagged Comfort Food, Cooking, Food, Food Photography, Foodie, Greek, Greek Food, Oregano, Recipes on May 17, 2013 by AnotherDish. 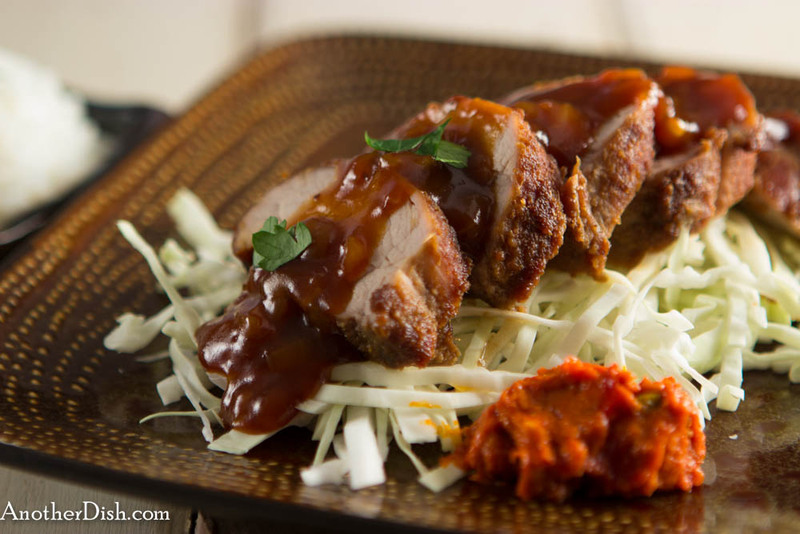 This is one of my favorite Indonesian pork recipes — it smells so good as it’s cooking! I love the sweetness of the kecap manis, together with the hint of sour from the lemon juice. I’m pretty sure they’d use tamarind water instead of lemon juice in Indonesia, but I really like what the citrus does for this dish. It’s a quick and simple dish (relative to my other Indonesian recipes), and the ingredients should be easy for anyone to find. Hope you’ll give it a try! Combine the pork, onion, garlic, ginger, brown sugar, sambal ulek, salt and pepper in a bowl. Stir well. Heat oil in a wok or similar pan over medium-high heat. Add the pork mixture and saute until pork is no longer pink (about 5 minutes). Add the kecap manis, chicken broth and lemon juice, stirring to combine. Bring to a boil, then simmer over low heat for about 30 minutes, until the liquid has reduced considerably. Serve with steamed jasmine rice and sliced cucumbers and relishes. This entry was posted in Indonesian, Pork and tagged Cooking, Food, Food Photography, Foodie, Indonesian, Indonesian Food, Jasmine Rice, Kecap Manis, Recipes, Southeast Asian Food, Spicy on May 14, 2013 by AnotherDish. I pulled out the grill (I have a charcoal grill — I prefer the end results over gas) for the first time this spring. I made one of my favorite chicken recipes, Gai Yang. Gai yang is a beloved “street food” in Thailand — you find it everywhere, and when you get it, it comes in a plastic bag, together with another plastic bag of delicious spicy pepper dipping sauce. The marinade for the chicken calls for a commonly used ingredient in Thailand, including fresh, scraped coriander (cilantro) roots. If that’s not available, you can use the stems of the plant (which is what I use, and it seems to work well). 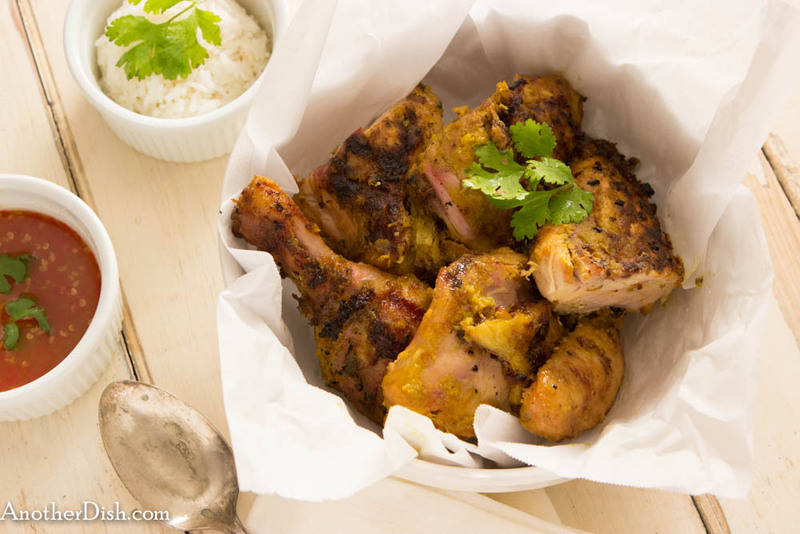 This grilled chicken is flavorful and wonderful. I hope you’ll try it! Add lemongrass, ginger, garlic, coriander root (or stems), turmeric, brown sugar, fish sauce and oil to a food processor. Puree to a very fine paste, adding additional tablespoons of oil as needed. Combine chicken pieces and paste in a large bowl. Mix well and marinate in the refrigerator for at least 2 hours. Be sure to stir chicken mixture occasionally. Grill chicken about 25 minutes, until cooked but not overdone. Serve with steamed jasmine rice and a spicy Thai chili dipping sauce. This entry was posted in Chicken, Comfort Food, Main Dishes, Thai and tagged Chilies, Comfort Food, Cooking, Food, Foodie, Recipes, Spicy, Thai, Thai Food on May 8, 2013 by AnotherDish.